It’s almost summer. The best time of the year is around the corner, and you need to be ready for it. One thing that is very helpful is to know is how to properly save and store your money. We are all going to need our money for the summer, so here are four good tips to help you keep it in your pocket. One good way to help you learn how to save and budget your money is simple. Take out your credit cards and debit cards. Most people feel compelled to spend money with their cards because it creates the illusion that you have more money in your account and encourages you to keep on spending. To avoid this, use cash only. 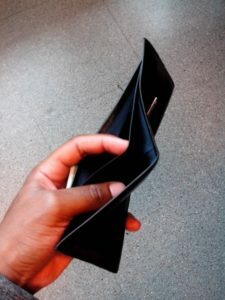 When you physically see the amount of cash that you use for a purchase, it creates a physiological pain of separation from your money that encourages you not to spend. It even makes you want to return your item to get your money back if you do it right. Next put your money into your savings account or a safe place so that you cannot get to it so easily. Only get the amount that you’re comfortable to spend and store the rest somewhere else. With the little amount you have, you must have the mindset of getting through the week with it. This will encourage you to ration your money accordingly and precisely so that you will get through the week without having to spend too much. Also, bring your own meal. Food is a necessity for everyone; they have to eat. However. constantly going out to restaurants, fast food stores, or even corner stores all end up hurting your wallet. To avoid this simply bring your own meal to eat during the day so that you won’t be hungry or forced to pay for more costly food that will hurt your budget. Lastly, do things. By that I mean go do a home workout or a jog, even volunteer work. Do anything to keep you occupied and moving. Keep yourself busy. People are more tempted to spend because they feel as though they can use money to create fun and happiness. When you constantly go about and be active, you not only get a more active lifestyle but you also lose the urge to buy. In addition, you are typically too tired after to do anything like going out to other places where you would have to spend money to have a good time. When you’re constantly sleeping, the days go by faster also. So just think of how fast time will go and all the money that you didn’t spend. It will add up to some hefty savings. Just follow these four tips and you will have more than enough cash in your pocket to last you into the summer and also through it!